When Mike Arnold thinks about solar energy, he thinks big, as in the "more than one-hundred-million-billion watts of sunlight that the Earth continuously bathes in." But he also thinks very, very small, exploring how a one-billionth-of-a-meter thick carbon-based nanomaterial could dramatically reduce the price of producing electricity with solar cells. 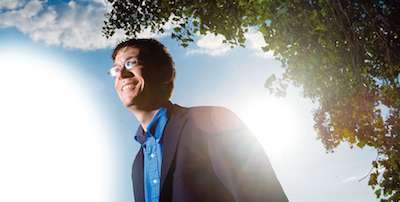 Arnold, associate professor in UW-Madison's Department of Materials Science and Engineering, leads a research team that focuses on the study of advanced electronic materials for photovoltaic (PV) solar energy, energy storage, and semiconductor electronics. Developing materials that can bring down the cost of PV energy is his team's passion and primary goal. "We are all familiar with the upside of solar energy," Arnold explains. "Abundant sunlight, no emissions, no moving parts, no noise, and easy transport, but that leaves a lot of people wondering why we still have coal plants and don't have solar panels on every rooftop. And the answer is definitely 'cost.' Even though prices for producing solar energy have fallen dramatically over the last couple decades, we haven't yet reached the point where photovoltaic energy can compete economically." Photovoltaic energy is created when photons—or packets of light from the sun—travel the almost 93 million miles to Earth and strike a solar cell. When the semiconducting material in a solar cell absorbs sunlight, an electrical charge is generated. It's then the job of the solar cell to separate the charge so that it's positive component goes to one side of the solar cell and its negative component goes to the other, thus producing an electrical current. These solar cells are grouped into modules, and these modules are grouped into the panels we see on rooftops and in solar fields. "The 25% efficiency of silicon solar cells is quite good," Arnold says. "It's the price of silicon as a raw material and the high cost of processing that makes it hard to bring down the cost of PV. What we need are cells that are just as efficient but much cheaper to make." Some "second-generation" alternative PV materials, such as thin-film solar cells, are being explored by industry and have even been commercialized. But the solar energy price tag remains high with these technologies, and the focus of most PV research is now on so-called "third-generation" nanomaterials such as those studied in Arnold's lab. "Nano" refers to the remarkably small size of these materials; a nanometer is one-billionth of a meter. Arnold's approach is to start out with very inexpensive materials that, in principal, could be made into solar cells and then devise a way to make them work. Currently, Arnold's team focuses on carbon-based nanomaterials called graphene and carbon nanotubes. These nanomaterials are synthesized in the lab using a process called chemical vapor deposition, in which hydrocarbons (gases such as methane (CH4) and ethylene (C2H4)) are converted into pure carbon. "These materials are as thin as you can imagine… you really can't make anything thinner," Arnold explains, making it easy to understand why the scientific community sometimes refers to these materials as "2D." "When we get down to this single layer of atoms in graphene and carbon nanotubes," Arnold says, "they are some of the best electrical conductors we've ever discovered and their electronic properties are much easier to control. They're powerful light absorbers, relatively stable, easy to synthesize, and inexpensive since carbon is so abundant." Arnold's team is currently exploring the use of both graphene sheets and carbon nanotubes in solar cells. For one project, his team is creating carbon nanotubes with different diameters that absorb different wavelengths of light; in a solar cell, this variety of diameters could help to increase overall light absorption. "We can potentially harness the power of a lot more light by varying nanotube diameter," Arnold explains, "all the colors in the rainbow as well as the ones in the spectrums that we can't see." Arnold is committed to exploring the potential of carbon-based nanomaterials as a low-cost way of harnessing the sun's tremendous power, and transforming the field of solar energy. "We are working hard to better understand their properties and try them out in actual solar cells in a lot of different ways. We feel like our current research is bringing us closer to the day when we really will see solar panels on every rooftop."